In our house Sunday night is an ideal night to attempt to get everyone eating the same thing, at the same time. It’s also a night I like to experiment with food, and try new things out from all the cooking blogs and mags and books I’ve been devouring during the week. All good in theory – but I’m pretty certain the kids won’t go near most of my experiments. So compromise is required. Tonight I compromised. 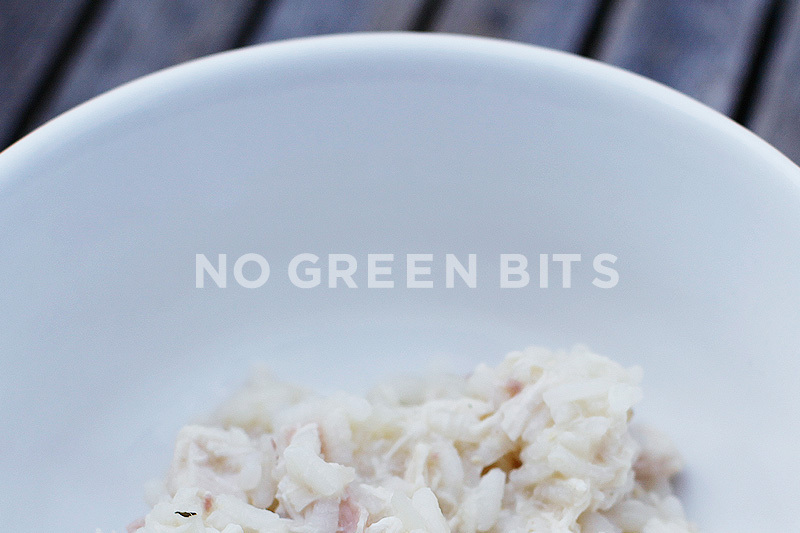 I decided it wasn’t a night for food experimentation, but a night for an old faithful – risotto. I had a nice BBQ chook in the fridge that I wanted to use up. Plus some random vegies. I love cooking risotto. Particularly after doing a risotto cooking class many years ago at a Sydney institution - Il Baretto, in Surry Hills. And then especially after being diagnosed with Coeliac disease. Most kids enjoy it – due to it’s creamy texture and cheesy taste. However, if there’s too much green in it – my kids suddenly lose their appetite. So I created a pure, white version for them (see pic above), and served their pre-approved vegies on the side (carrot & tomato). We had a sweet potato and herb topped version. Sigh. 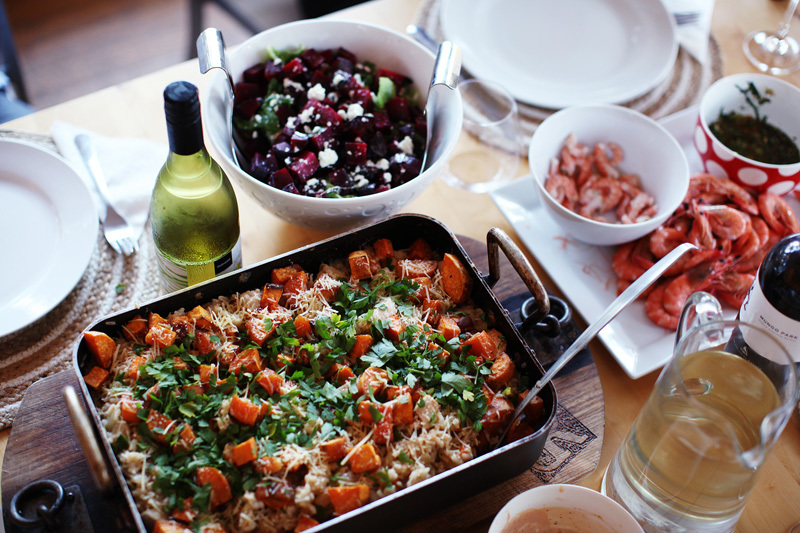 We are getting closer to family food alignment – but we’re not quite there yet. 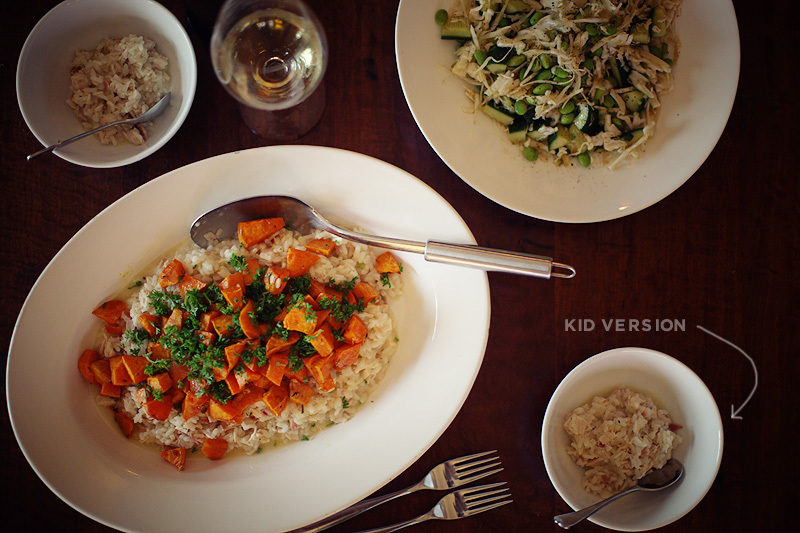 Tim’s beautiful chicken risotto with sweet potato – cooked on holidays so tastes doubly good. So tonight’s risotto was inspired by my friend Tim, who cooked up a mean batch of his version over the summer holidays (see pic above). Mine had an Asian coleslaw on the side – mainly as I had cabbage and edamame beans on hand. It was a bit of a random, fusiony match, but it sorta worked. Tim’s salad match was much better – a beetroot and goats cheese number. A similar recipe is here. Feeds about 4 peeps – 2 big hungry ones and 2 small ones. Get hot: crank up the oven first – to prepare it for the sweet potato. About 180 – 200 degrees. Hot potato hot potato: peel and chop the sweet potato into 1cm cubes. Put into a large bowl and add a tablespoon (or more) of olive oil, salt, pepper and the chopped rosemary. Mix it all up with your hands until all the pieces are coated well. Get a baking tray, line it with baking paper and place the potato evenly in a single layer. Bake for about 20 – 30 minutes until they’re well cooked. Check half way and give the taties a turn. Should smell pretty amazing. Once cooked (mine took 30 minutes), take out of the oven and set aside, covered with foil to keep warm. Hot stock: put your stock in a saucepan, and bring to a gentle simmer. Then turn it down so it’s not frantically bubbling away, and keep it on a low heat. 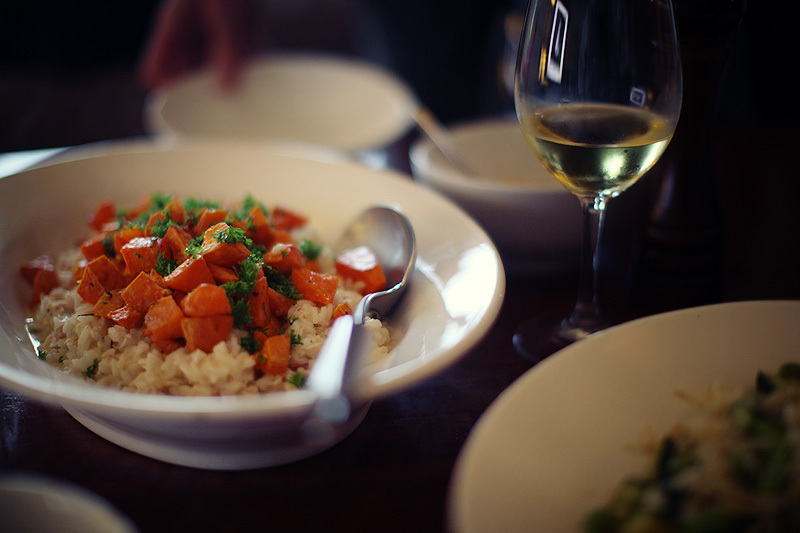 The risotto foundation: Whilst the sweet potato is cooking, you can start the risotto. Heat a tablespoon of olive oil and the butter in a large frypan or saucepan. Then add the onion, garlic and pancetta. Cook these up for a few minutes – until the onion is soft. Rice time: Then add the arborio rice. Stir it really well – you want the rice to be coated in the mixture. Cook for another few minutes – until the rice starts to look opaque. Keep stirring and watching – you don’t want it to burn.Then add the wine and simmer it up until all the liquid has been absorbed. Rice maintenance: Now is when you need to really show the love to your risotto, and just hang by it’s side for 15 -20 minutes or so. Make sure the heat is just on a low simmer – as you don’t want the rice to cook too quickly on the outside. Start to add the stock – about half a cup at a time, stirring and allowing it to be absorbed before adding the next lot. Keep adding ladlefuls of stock, stirring gently. Also keep tasting to check how the rice is doing. Add the chopped chicken pieces in towards the end of the cooking process. Once the rice is soft – but still with a slight bite, take it off the heat. I often run out of stock – if you do, just add some more boiling water. Season: Have a taste – then add some sea salt, freshly ground black pepper and about 3/4 of the parmesan. Finish: Hopefully the timing is such that both the potatoes and rice are now both cooked and ready to get together. I like to serve this on a big plate so everyone can help themselves. Find whatever vessel you want to serve it up in, and spoon out the rice first. Then add the sweet potato across the top, followed by the remaining cheese, then the chopped parsley. Dinner is done. Eat up.